Compact sedans are the latest piece of the market which everyone is after. The volumes speak for themselves and the pundits expect it to grow at a rapid rate over the next few years. The big guns are already in the fray and no one is letting up. Ford, of course, is the latest one to turn their attention to this sub-four-meter section and they bring fresh promises with them with the Figo Aspire. And although it carries the Figo badge, this showcases what the next generation Figo will rather than then existing one. The 1.2-litre Petrol engine for the Figo Aspire is based on the same motor that powers the petrol variant of the Figo hatchback that we all know of . However, for the Aspire, this four-cylinder, naturally-aspirated unit has got some major revisions in favour of enhanced fuel economy and performance. This Twin Independent Variable Camshaft Timing (Ti-VCT) equipped engine is sufficiently refined and revs rather freely. However, low-end performance is not its forte and frequent gearshifts are a must in situations like stop-go traffic. It is on the highways where this motor really impresses. The engine makes for quite a sprightly performer and there’s so much juice on offer towards the top-end of the rev-range that one would be hard pressed to not keep this engine on the boil. Top speed, at above 170 km/h, is nothing short of impressive for a sub-4m compact sedan and even the in-gear acceleration is pretty good. The gearshifts, too, are precise and the shift-action is smooth. However, among the two engine variants that we drove, it is the 1.5-litre Diesel version that was more enjoyable. This is the same 1.5-litre turbo’ed oil-burner that does duty on the Fiesta and the EcoSport, but has been re-tuned for the Aspire to churn out a maximum power of 100 PS. This might have been done to match the Amaze’s segment-leading power of 100 PS, but what sets the Aspire apart is the way the motor goes on about its business. The turbo lag is minimal and come 1400 rpm, and the Aspire Diesel charges forward with almost a ferocious velocity. The torque is well spread throughout the rev-range and pushing this car to its limit is just too much fun. We recorded a speedo-indicated 185 km/h, which, when compared to the Amaze-D’s top whack of 145 km/h, feels rather stratospheric! The diesel variant is equally athletic even lower down the revs and doesn’t break sweat even when chugging along at 40 km/h in fourth gear, with the tacho needle hovering at a leisurely 1100 rpm. Akin to the petrol variant, gearshifts are precise and the clutch action is light. The NVH levels could have been a bit lower, but frankly, we are almost nitpicking here. Ford may have been late to the compact sedan segment but it’s used its time well. Sure, the Aspire may not be as special to drive as other Fords (including the Classic it is to replace) but it does offer everything to help it appeal to a wide buyer base. 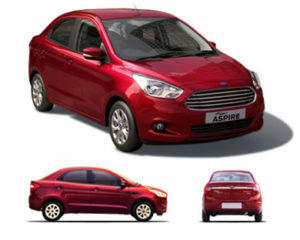 Ford has clearly spent a lot of money to give buyers what they want, be it in terms of newer concerns as connectivity and safety or in traditional requirements of space, comfort and efficiency.Assuming the Figo Aspire is priced in close proximity to the current market leader, the Swift Dzire, as we’ve been led to believe, Ford’s all-new compact sedan could just become the new benchmark in the segment.